Although technical users or developers will implement these pieces, XPM and ST requirements are business-driven. Here as some example formats I've been using on recent projects. Although I hint at some of the process, this isn't a comprehensive guide as there is more that you'll want to consider in a SmartTarget or Experience Manager setup! Here's an example of a specification for XPM regions, which directly translate to the XPM format code template developers will need to set up. 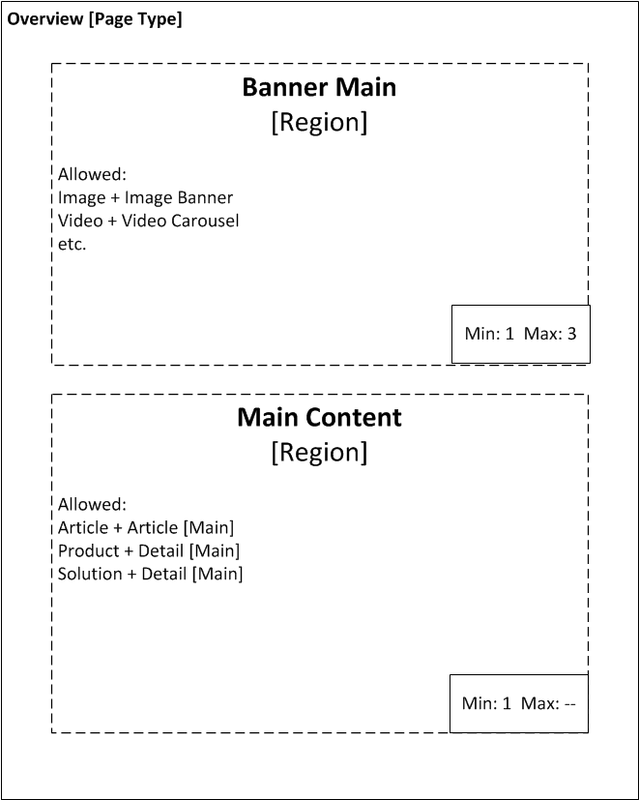 Create a set of regions for a given website or shared "design." In terms of implementing regions, consider the configurable XPM Region option Nuno Linhares shared or see the Tridion Reference Implementation for a way to automatically create MVC view-driven XPM regions (login required). 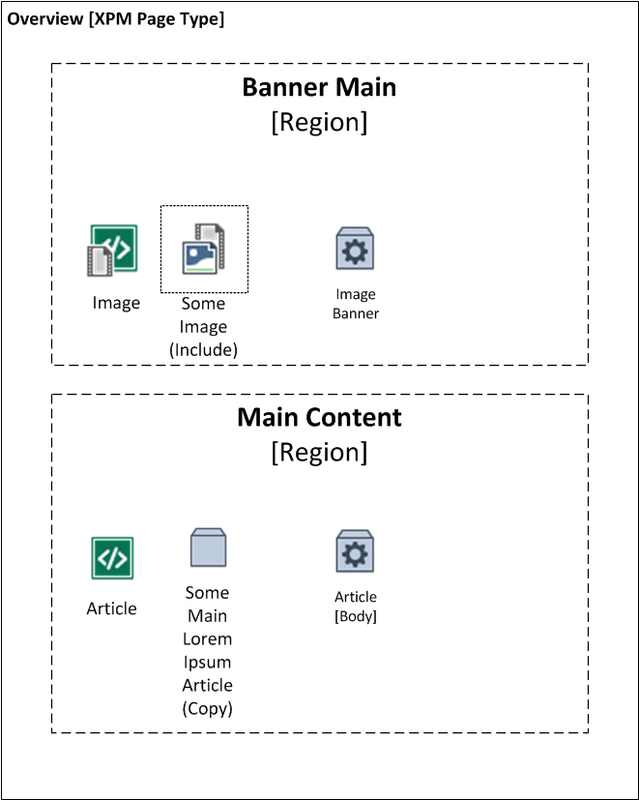 Confirm page types, content types, and regions. Then after designing Tridion Schemas, Component Templates, and Page Templates, you revisit example and "prototyped" (to be copied) content and create the page types and content types you started with. At the minimum, you need a working Tridion page to create a Page Type. Set the "[x] Use this Page as a Page Type" check box and in the Component Presentation tab, set each Component Presentation. You could create a table like this. You don't necessarily need a diagram for the page type, but visually you might use icons or more boxes to explain the above table. If already set up, you could take a screenshot of the configured page type in XPM. This is a bit much for a single table for all Content Types--one table per Content Type would work better in documentation. Pictures from the wireframes or creative can also help. Borrowing from the Tridion Reference Implementation, you might add screenshots for something like a teaser. But I would recommend setting up XPM first, have CMS users create prototype Components, and then confirm how these will evolve. With so many variables, I think interviews and iterative Content Modeling is the best fit for these (and as such, CMS consultants might not be the ones defining these). SmartTarget 2014 lets users configure promotions from the integrated Slide Out Navigation by choosing which list of promotions (Staging for testing vs Live for production), which publication, and visitor or session-related triggers will cause a visitor to get a given promotion. SmartTarget regions have a different purpose that XPM Regions, but you might consider a way to consolidate or create a switch between CPs in an XPM region and fallback CPs in a SmartTarget region. The desired default and custom triggers for promotions, based on business requirements and known data for the client's personas. This will be available in the SmartTarget promotion settings. In this following example, my client had existing and new segmentation and geo-targeting attributes it wanted to target. To be able to tag content for these as well, I documented the options for the Content Manager-side in the Categories and Keywords. Though specific to SDL software, these are still related to functional specifications. Technically, the Footprint acts against Ambient Data Framework (ADF) keys, but the functional task here is to confirm the personalization scenarios CMS users need to manage as well as test. The actual implementation may adjust these as needed (not all "personalization" will end up being SmartTarget). Update (2015/06/10): to be clear, the triggers and footprints are independent of Content Manager Categories. I sometimes re-use a list defined in my documentation, but this isn't integrated (but would be a nice feature). Allow ST ability to trigger on Visitor authentication. Allow ST ability to trigger on Visitor Segment. This will be used in promotions. Allow ST ability to trigger on Visitor location. If using SDL Tridion's Audience Manager, consider defining some custom personas for testing as well. In order to promote content with ST, we need regions in addition to the triggers. Like XPM regions, ST regions have names and limits (but no minimum). You could document ST regions in a table as well. Finally, with SmartTarget Regions and Triggers set up, CMS users will create the actual ST promotions. But at this point, you're at the level of managing the promotions. You may want to suggest some examples or get typical use cases, but CMS users business or Marketing users will create and manage the promotions using the regions, triggers, and custom footprint you've defined. Welcome to the new modeling! To keep it clean, I'm opting for "X" instead of Yes/No everywhere (like how I prefer feature-based CMS designs). But if you're serious about agile" CMS development, consider prototyping and creating the Schemas jointly between developers and the CMS authors.